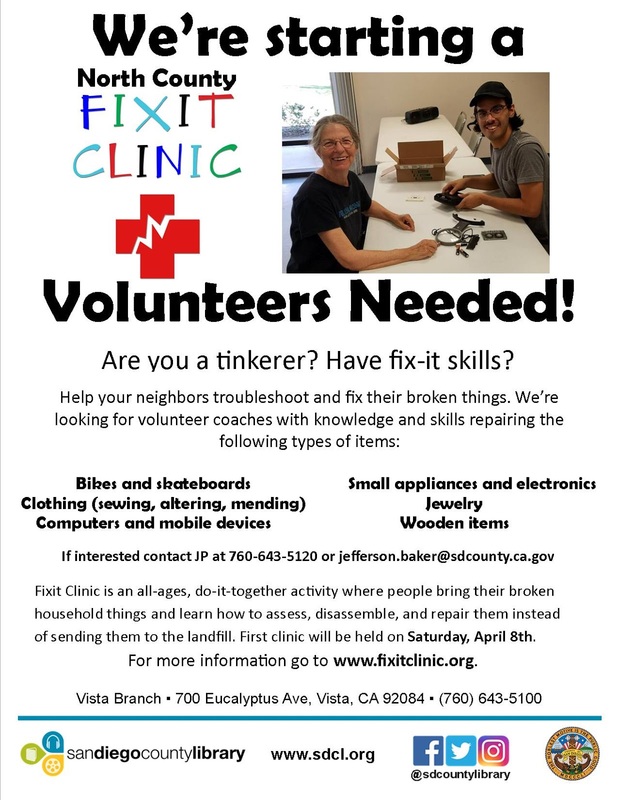 Fixit Clinics are community-based educational workshops that build resilient communities through transferring critical thinking, disassembly and troubleshooting skills; we use people's broken items as the subject matter to transfer these skills, repair is a just a side effect. At Fixit Clinic we expect "participants" to participate: i.e. participate in their own disassembly and troubleshooting. At an ideal Fixit Clinic everybody's helping everybody else out. Ideally you want to hold ongoing Fixit Clinics at various locations around your community, not a single Fixit Clinic event. Groundwork is key: you need to 1) be constantly recruiting and sustaining a healthy complement of "Fixit Coaches" and 2) to identify and get buy-in from sponsors and patrons with a broad regional perspective. Step 2- A critical mass of coaches is hard to maintain from a single community or venue: you need to share the resource across multiple communities and locations. To help, recruit sponsors and patrons with a broader regional perspective (rather than a single library or town.) For example: a library system rather than a single branch. Step 4- Once you have 1) sufficient Fixit Coaches and 2) a venue: then think about a day and time; we've settled in to weekend dates (Saturday or Sunday) in a three-hour window between 11AM and 5PM, but you're welcome to experiment with other days and hours. BONUS: contact us at fixitclinic@gmail.com before finalizing the date: maybe we can send veteran Fixit Coaches or other resources. Step 5- Once you have 1) Fixit Coaches 2) a venue and 3) a date/time, contact us to add your event to the list of scheduled Fixit Clinics, and let us know if you want us add your event to the sign-in form and our social media outreach, etc. - When you’re ready to start actively recruiting Fixit Coaches let me know and I’ll add your location to the the pull down menu of specific locations actively recruiting Fixit Coaches on the form: goo.gl/kwVNlv (same as immediately above) and post liberally or share via email or NextDoor, etc. Example 3: Fixit Clinics are being held regularly at the Cabot Science Library at Harvard University. More and more colleges and universities are teaching leading with "design thinking", they want to teach designing for sustainability (durability, serviceability, maintainability, repairability) alongside Design for Manufacturing. Thus we've held Fixit Clinics at Harvard, MIT, USF, and University of Colorado Boulder with more schools coming. Maybe your local college or university is interested in sponsoring Fixit Clinics as part of their design program or engineering program? Example 4: Does your High School or Middle School have a student environmental or recycling organization? 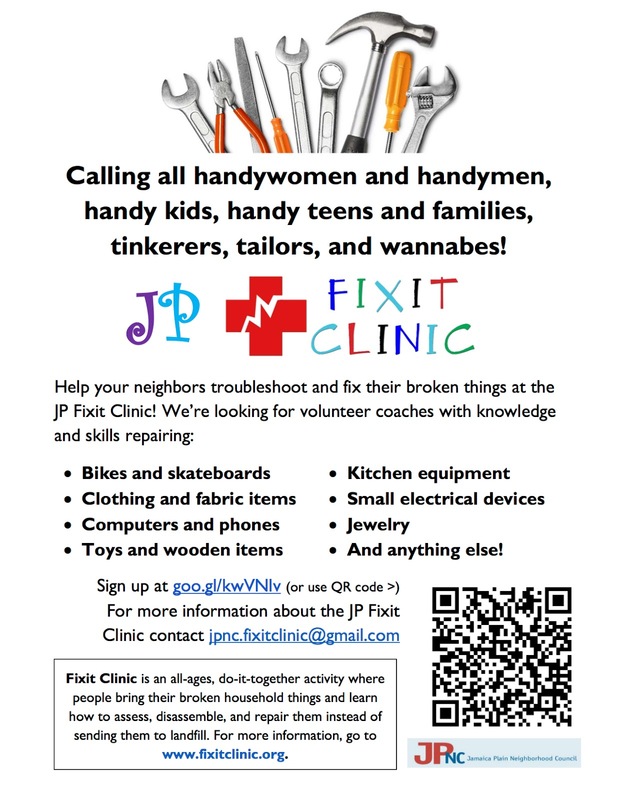 We'd like to hold more Fixit Clinics rotating through school systems.